All is wonderfully well here in wintery melbourne (I am writing this with a curtain of pure blue sunshine spilling into our little flat). The last month of winter here is approaching fast and I am SO DARN excited for spring, green trees, growing seedlings on our windowsills, bare limbs and gently spring sunshine. Yum. To be fair winter here in Australia is an absolute delight too really, I am English and am used to 5 long months of cold, grey and drizzle with the odd sprinkling of clear skies and snowy mornings. I miss the snow, but I dont miss riding to work on sleety streats with a waterfall of rain infront of my eyes. I can count on my hand how many days I have had to ride my trusty bike through rain thus far this winter, and when it does happen theres a real sense of naustalgia for good ol’ Blighty, and a childhood of red wellies and splashing in muddy puddles. The thought comes up that little creativity has been going on in the last month since posting here….but im not sure that is really the case, more that my mind has been flittering around getting excited by lots of different projects all rather unrelated to each other. There has been little bursts of garment making and much crocheting in front of our little stove snuggled up with the oh-so-scrumptious gentleman and series after series of Spooks. 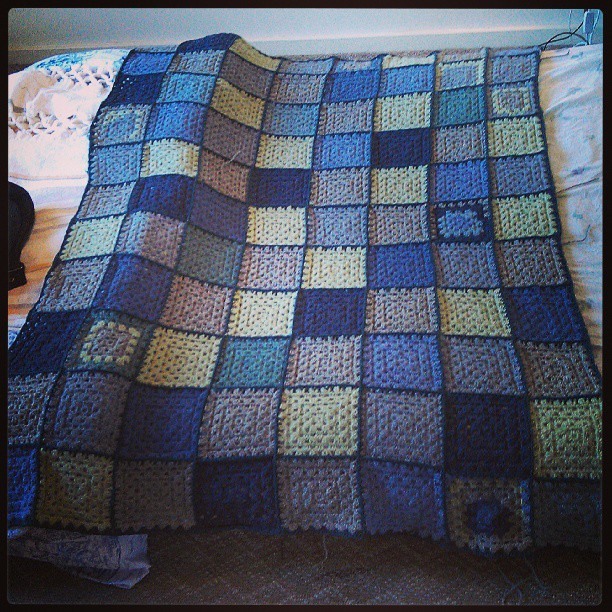 I finally completed an 82 square Granny-Square blanket I started back in spring last year when I was WWOOFing (Working on Organic Farms) on Tom’s parents land for my visa extension. It is made from the softest alpaca/lambs wool blend in a range of blues, greys and greens, and reminds me of stormy oceans. Im sure we will get much more use from it before the winter is through as it is a perfect little movie blanket to throw over our laps on the sofa. 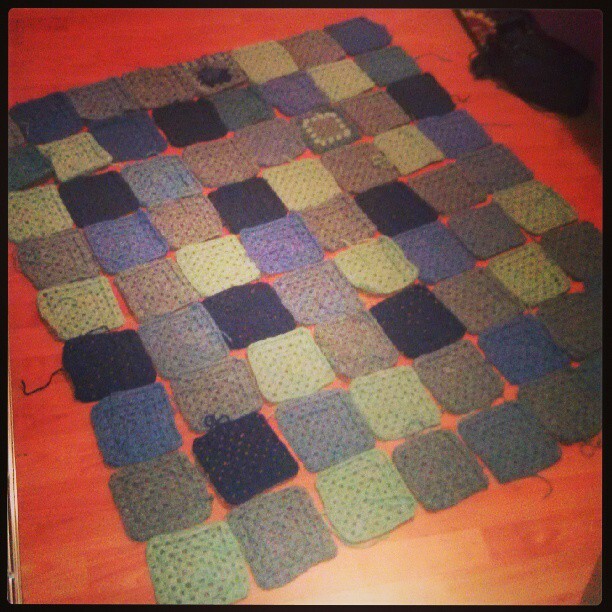 Below are a photos of it in progress, the last one is it finished except that I added a large 3” border around the outside using the same teal wool that I connected to squares with. 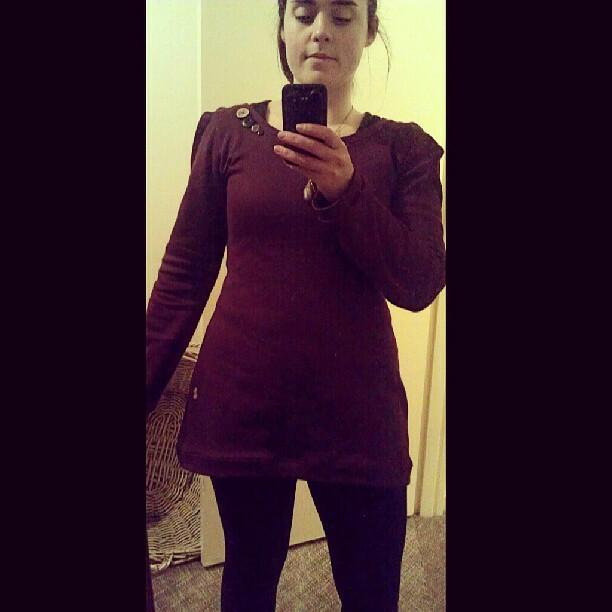 A couple of weeks ago I also made this little jumper dress for myself out of some cheap fleecy material that was remnented at my local fabric warehouse. 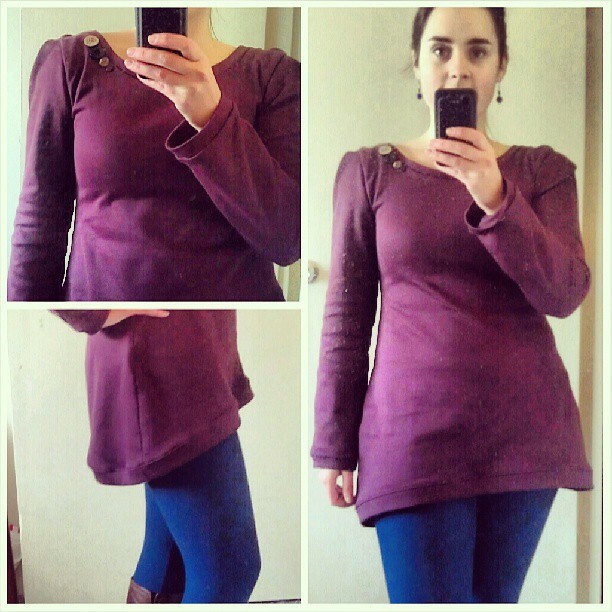 The fabric is a polyester which I would not usually buy but I fell in love with the colour and the inside is so unbelievably soft and fleecy and Im always desperate for warm layers that work well over dresses and leggings. And the fabric was $6 a metre…sooooo. 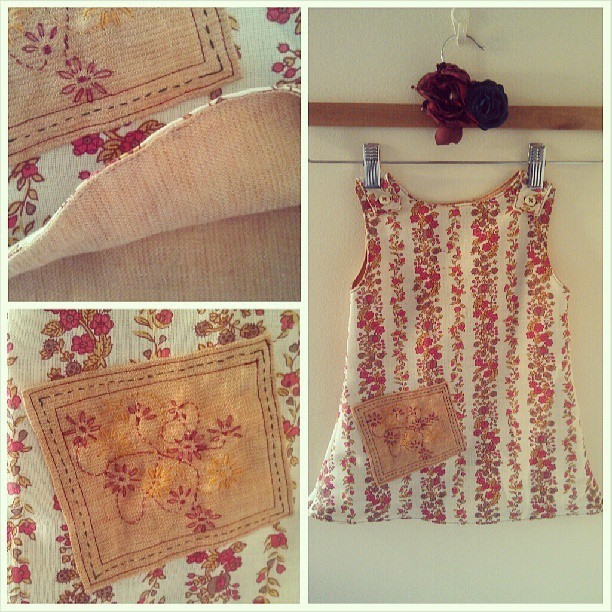 This week was the last week of one of my favourite Op-Shops (thrift store/charity shop) being open here in Melbourne. Its relocating to an unknown address and Im so sad, they always had the best fabric collections and are one of the only Op-Shops around here that actually has a wool collection worth speaking of. So ill be hunting down my new favourite places to grab bargains soon…but until then I pretty much bought them out of the lasts of their fabric collection and scored a SERIOUS bargain. $17 for well over 6 metres of random peices of vintage floral materials! I cycled off a happy gal with a bike basket spilling over with colourful springtime prints. I knew as I was buying them what they would become, and the photos below are the humble beginnings of a collection of recycled fabric dresses for my ‘Selkie Child’ line that I am working on to sell alongside my Women’s clothing. They are super simple to make but just so wonderful when they are complete, their linings clashing beautifully and little details of lace trim and bright buttons. I have been hankering for an excuse to handsew recently and had a great time working on these little embroidered patches that I am adding to the dresses as they are completed. 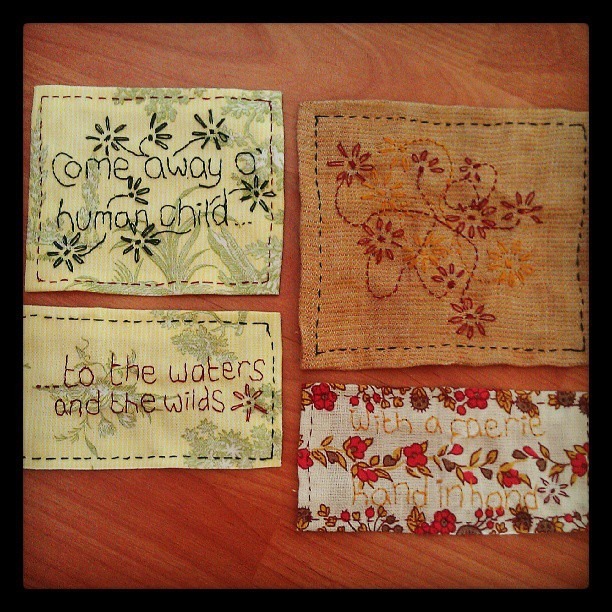 Embroidered onto the patches are excerpts from one of my favourite poems ‘The Stolen Child’ by W. B. Yeats. 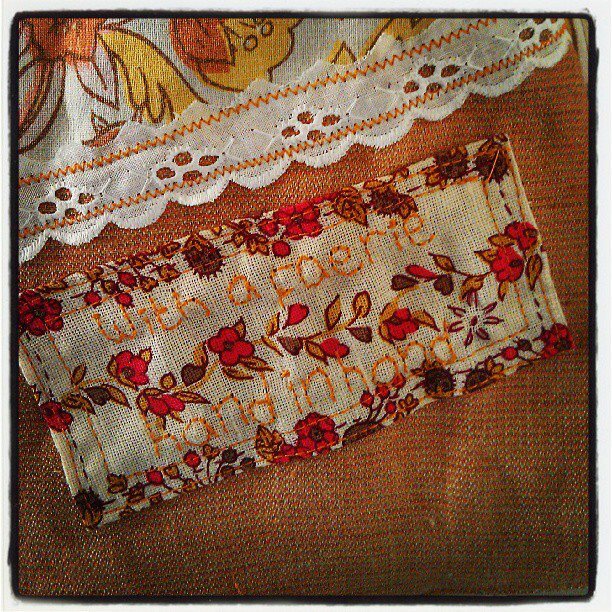 It’s a long poem with many verses but I love the section ”Come away O’human child to the waters and the wilds with a faerie hand in hand for the world’s more full of weeping then you can understand.” Below are the patches that I have completed so far. 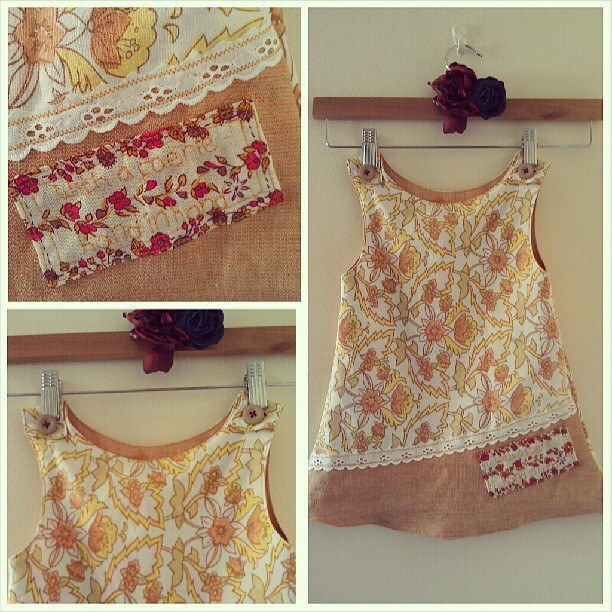 I love handsewing! Im so slow and not very neat (im sure my great great grandmothers would be turning in their graves!) 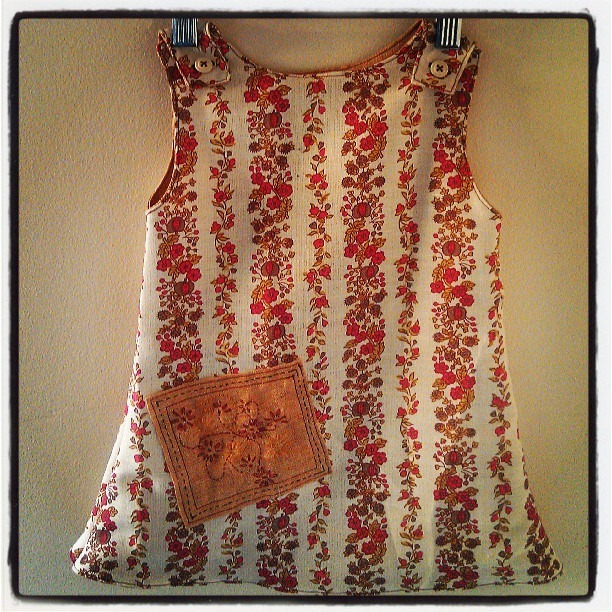 but I think they are sweet and nostalgic and add a little bit of fanciness to the finished dresses. I think thats pretty much it for now folks, Its lovely to see more and more people following this blog so I dont feel that I am just talking to myself anymore. I love recieving your comments and if anyone is interested in purchasing anything they see here, or have any ideas for custom orders or collaborations then I love a good challenge and just drop me a comment below!